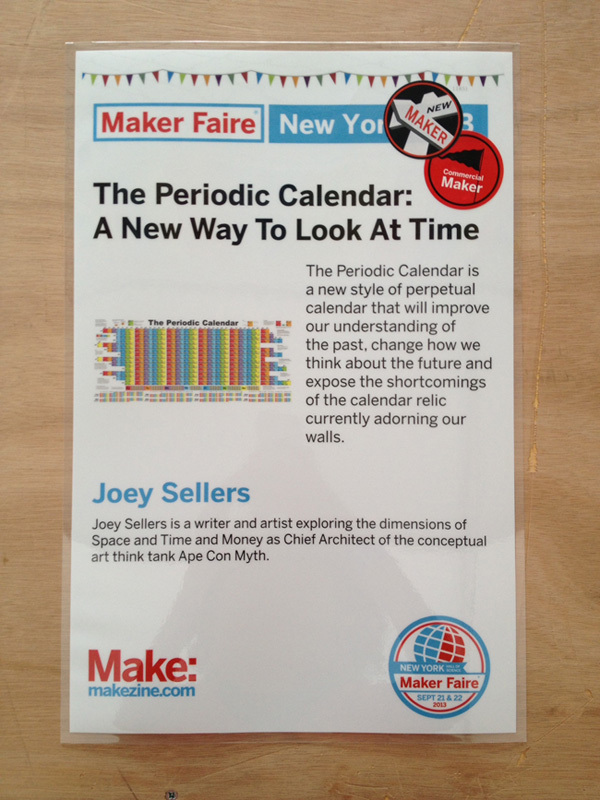 After two days of exhibiting the Periodic Calendar at World Maker Faire in New York, it ended up taking five days for my voice to come back! But that’s what happens when you talk pretty much non-stop for eighteen hours. 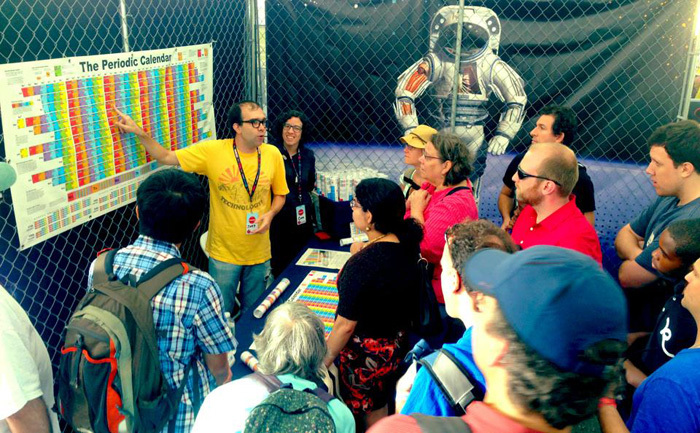 This was my first time being part of Maker Faire and I took it seriously when the schedule called it “SHOWTIME”, for a show is what I tried to give the wonderfully smart, curious and friendly crowd this remarkable event brings in. 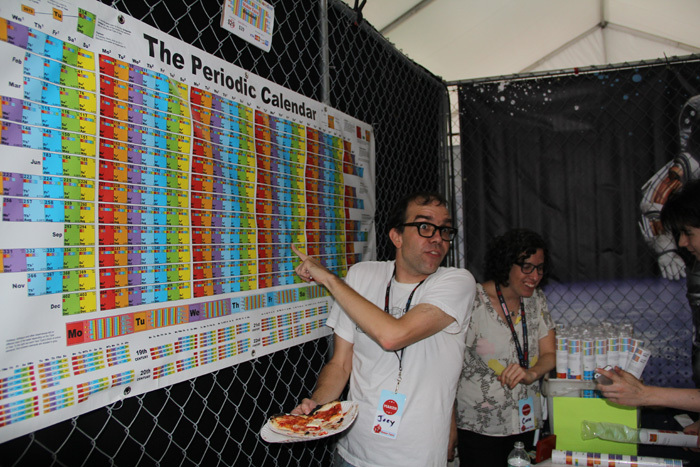 If you’ve never heard of it before, Maker Faire is the “Greatest Show (and Tell) on Earth”. A manifestation of DIY culture with a heavy technological bent, makers are the new garage bands. And as we were getting started on Saturday morning, I was a little intimidated looking around at my neighbors. 3D printers were spitting objects out in every direction, Google was a few spaces down, NASA was around the corner and there I was talking about something printed on a piece of paper. Why was I at Maker Faire? … Because I’m a conceptual maker. While I might not be handy with tools and can pretty much guarantee that anything I take apart is done for, I love deconstructing ideas as much as I enjoy putting them back together again. In fact, I’m driven by the idea that humanity’s problems are mainly in our head at this point. So lack of hardware aside, I felt like P-Cal fit right in with the diverse range of innovative works being showcased at the New York Hall of Science last weekend. … Or so I continued to explain to wave after wave of visitors. The first two hours I thought I was going to pass out from the combination of nervous excitement, a fruit smoothie and a tight hat. Eventually I got the hang of speaking in a loop. I found myself in the midst of a verbal marathon, complete with the buzz of a time ball two spaces to my left announcing the top of each hour. A few hours into it and I couldn’t imagine stopping. 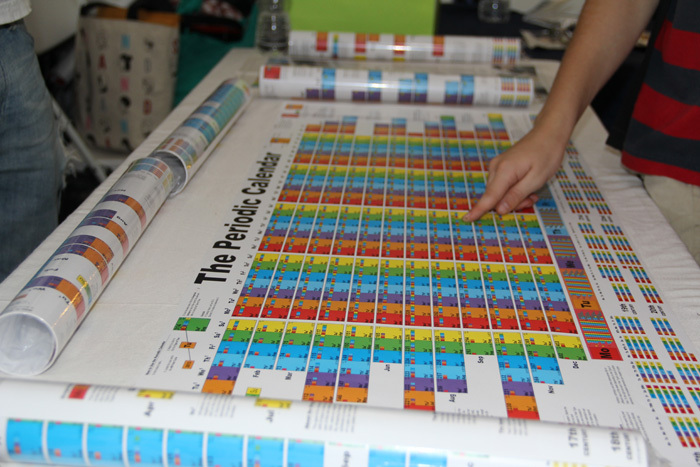 It didn’t matter if there was one person standing in front of me or twenty, everyone that came close got a sincere earful about what I’ve learned so far in the process of creating and exploring the Periodic Calendar over the last year. The crowd was full of questions too and it was particularly fun helping kids find their birth elements. What year was most common? 1999. Yep, fourteen year olds and younger were taking to the Periodic Calendar like fish to water. Watching their faces light up as they got how P-Cal flips around our perspective of time, I felt like a magician. There were plenty of adults with big smiles on their faces too when the revolutionary/ridiculous simplicity of P-Cal hit them, from the Englishman who was taught to always include the day of the week with the date back in school to the mathematician who just said “Yeah” about a millisecond into my explanation. And of course some reported not understanding a word of what came out of my mouth, although I assured them that the Periodic Calendar is the last calendar they’ll need for a reason. It takes seconds to learn, but will perhaps require decades to get the hang of. By the end of the day on Sunday, I was ready to collapse. But as if all the interactions and all the new P-Cal Pioneers roaming the Earth weren’t enough, I was surprised by two honors that absolutely made my day. 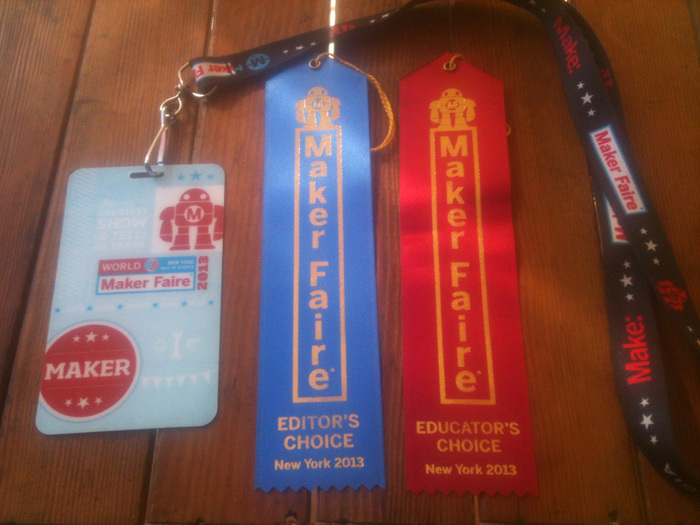 I knew the Maker Faire audience enjoyed the show, but would the Maker community think I was truly a fit? Happily the answer to this question was made clear when I was bestowed with ribbons for Editor’s Choice and Educator’s Choice by the staff of Make magazine! I couldn’t ask for much more than that and when asked if they would see me next year, my answer was a resounding “Yes!” I learned so much this first outing that I’ve already got a bunch of new ideas for next year’s presentation. And hopefully I’ll get a spot as part of the mother ship of all Maker Faires in the Bay Area next May! Thanks again to my co-pilot Cara, to everyone who came out and to everyone at Maker Faire for making it such an incredible experience. Subscribe here for updates and news on the Periodic Calendar's campaign to expand the fourth dimension!